The Adventure has officially begun! After a number of set backs, largely involving getting my campervan on the road, I’ve finally completed a full day’s section of the Coast Path. 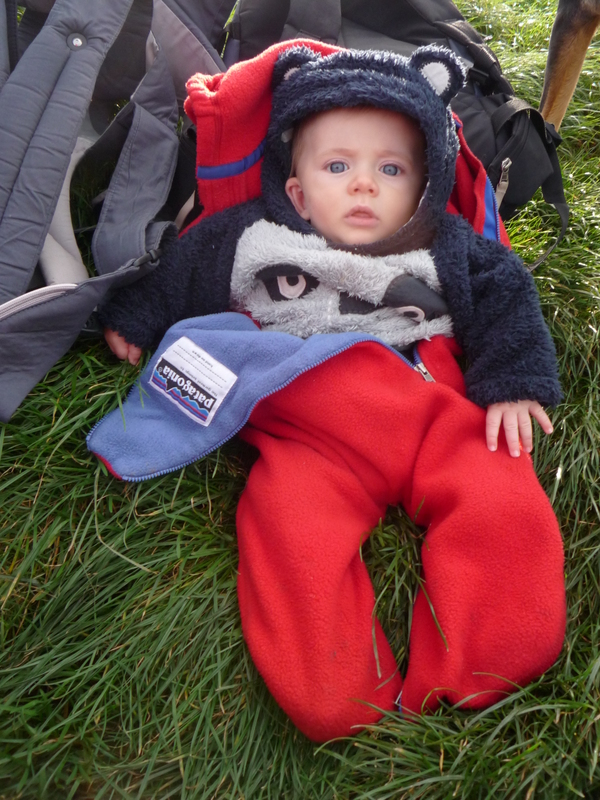 Toby and I were joined by Hayley and her 10 month old son Leo, both of whom provided much needed moral support to walk from Hartland to Clovelly. While Minehead is the official start of the Coast Path, it seemed like a good idea to start in north Devon to get a taste for the trail. This particular stretch has some of the most dramatic coastal scenery and it also happened to be of equal distance for Hayley to travel from Cornwall as it was for me from South Devon. If I were to walk the entire path in sequence from the start to the finish point in Poole, I would start in Clovelly and walk to Hartland Quay, but we changed it around to suit our needs and for good reason. Firstly, it meant we’d be walking with the wind largely behind us rather than against us, which, we figured, should help with the steep climbs. More importantly, it also ensured that as the daylight started to fade, we’d be finishing in the relative safety of the Clovelly estate with its sheltered woodland and harbour lights. Here at least we knew we wouldn’t be far from civilisation, while Hartland Quay is a good 2 miles or more from Hartland village. It was a wise decision. As we arrived at the quay, we were struck by the desolate beauty of the dark cliffs and the pounding sea that came to meet them. The huge swell and sea mist served to enhance the powerful nature of this scene and it was clear that negotiating this remote coastline, even in the best of circumstances, was not going to be easy. Especially not with two tiny babies in tow, in the fading light, on a potentially blustery Autumn day in late November. We were glad we were tackling this section first, while we still had the energy and enthusiasm to appreciate the landscape. Surprisingly, this was once a busy quay despite being exposed to the full fury of theAtlantic. Less surprising is that it was swept away in 1887 and The Hartland Quay Museum displays salvage from the many ships that have foundered here over the centuries. We didn’t have time for this though and after feeding the babies and getting them suitably dressed for a windswept walk, we were off. It felt like a relatively easy start, through a couple of fields with grazing sheep, but it soon became quite strenuous and we didn’t seem to cover much ground. We started to wonder whether we’d bitten off more than we could chew and hadn’t even reached Hartland Point. Then Toby started getting hungry again and it was difficult to know whether to stop as soon as some sort of shelter offered itself as a suitable spot to breastfeed, or to carry on till we reached the lighthouse. We opted for the latter as it hadn’t even been 2 hours since his last feed and I guessed there would be some sort of sea wall at the lighthouse to shelter behind. We marched on, past the lighthouse, which turned out to be below Hartland Point where we stopped to rest. To my pleasant surprise, there was a wall that formed part of a WWII pill box, so we sat behind it and had lunch. Meanwhile, the Lundy helicopter made about three landings and took off to the island from its launch pad just behind the point. All along the route the island had loomed on the horizon, becoming clearer as the sun slowly burned through the sea mist to reveal a bit of blue sky. We’d only achieved about three miles in two hours but our spirits remained high and we still had a good four hours of daylight left. Soon after, we passed a father and his son, who were surprised when we told them we were walking all the way to Clovelly but reassured us that we had an easier time ahead. This was good news. We decided we’d make some serious headway and were sure to be in Clovelly by 4pm for a well deserved cream tea. Off we went with a spring in our step and our bouncing baby boys, content in their carriers. 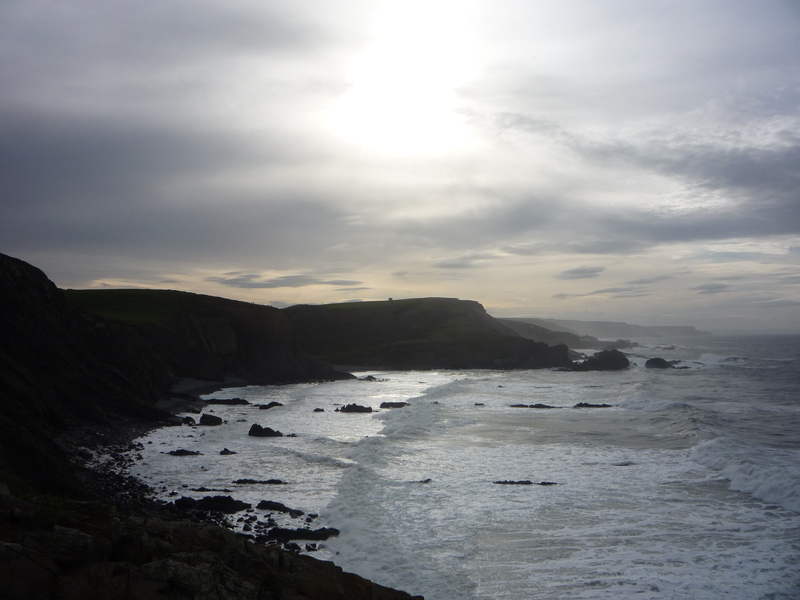 The weather was mild and the stunning sea views made it a very pleasant start to the afternoon. After another couple of hours, we hadn’t seen any more signs for Clovelly. The last one was at least 2 miles back and that had said Clovelly 6 miles. We guessed we must only have another 4 miles to go and were way past half way, or so we thought. If only we had a map with us. In my carefree way, I’d thought we’d be ok without one, since you only have to keep the sea on your left and follow the waymarked path. Easy. Or not, as it turned out. We soon discovered that Coast Path signs have a habit of playing tricks on you. When you think you’ve walked at least two miles since the last post for ‘Brownsham 2 ½ miles’, you see another sign saying ‘Brownsham 2 miles’. No doubt it’s correct, since Brownsham is inland so the distance was dependent on which route you took, but it didn’t help us to estimate how far we’d travelled and if we needed to pick up pace in order to reach the end destination before dark. As it was, by the time we reached Mouth Mill we were beginning to feel a little weary. 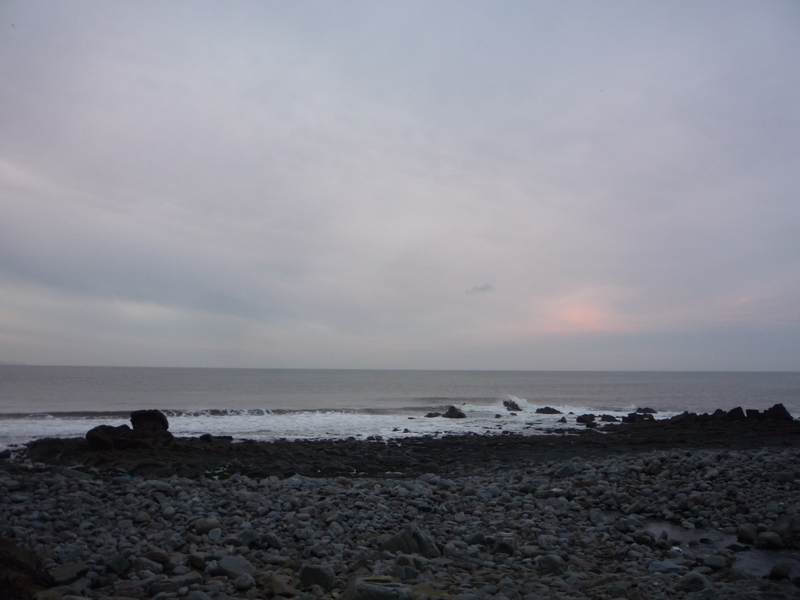 The sun was setting and since we’d just walked steeply downhill to this beautiful valley with a stream running through it and a picturesque rock arch to the right of the beach, we knew the only way to Clovelly is up and for an unknown length of time. We paused briefly to take in the tranquil scene and set off to make the most of the twilight hour. Strangely, our spirits seemed to lift and carry us faster and more positively than expected for two tired mums with hungry mouths to feed. In fact, knowing we had to get a move on made it more of an adventure and we had to use all the energy we could muster to do so. It soon got dark and the route took us through ancient woodland where the creatures of the night were beginning to stir. The calls of wood pigeons and pheasants echoed around us. Through the trees we could see the lights of the fishing boats in Clovelly harbour and this kept us going for the last leg of the journey. It was a relatively gentle climb along wide level paths that took us past The Angel Wings shelter with beautiful wood carvings, made by a former butler of Clovelly Court. This gave us a clue that the end was near and before we realised it, we had come upon a large building largely hidden by trees that could only be the Visitor Centre at the top of the village. ‘Hurray’ we cheered. ‘We made it – well done us!’ Just another 620 miles to go to complete the entire National Trail but that’s another day or 2 or 30 at least!